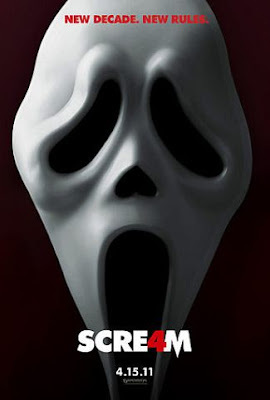 First look at the teaser trailer for the Wes Craven-directed 'Scream 4,' staring Neve Campbell, David Arquette, Courteney Cox Arquette, Emma Roberts, Hayden Panettiere, Marielle Jaffe, Rory Culkin, Nico Tortorella, Erik Knudsen, Marley Shelton, Anthony Anderson, Adam Brody, Alison Brie, Mary McDonnell, Anna Paquin, Kristen Bell and Brittany Roberts. "She ends the book tour by going to Woodsboro, and there she finds her cousin and her aunt and some friends and trouble ensues," Campbell told Entertainment Weekly of her character Sidney Prescott. "I'm bored with my life and bored with my marriage and bored with the silly small town of Woodsboro," Cox added about her character, the tactless reporter Gail Weathers. "When she [Sidney] arrives to promote her book, things start happening and I couldn't be more thrilled." It opens in cinemas on April 15.